Last spring Cassie, Paul Rowe and I did something I’ve wanted to do for as long as I can remember- find historic photos and then photograph what’s there now. All of our shots are of downtown Des Moines. Most of the images come from the awesome Historic Des Moines collection hosted by Drake University. We also found neat historic images here and here. 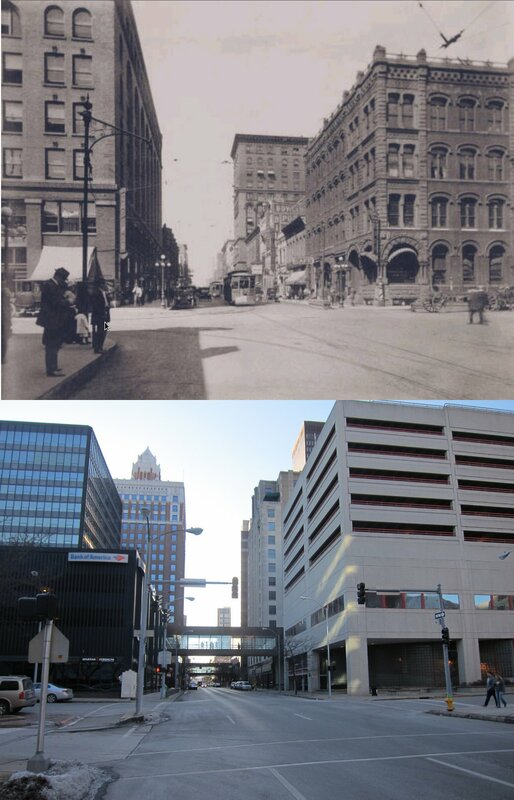 6th and Locust looking south, in 1911 and 2009. I can’t believe Des Moines got rid of those trolleys! Recently the city proposed putting in a much more limited tram system at a cost of $100 million. 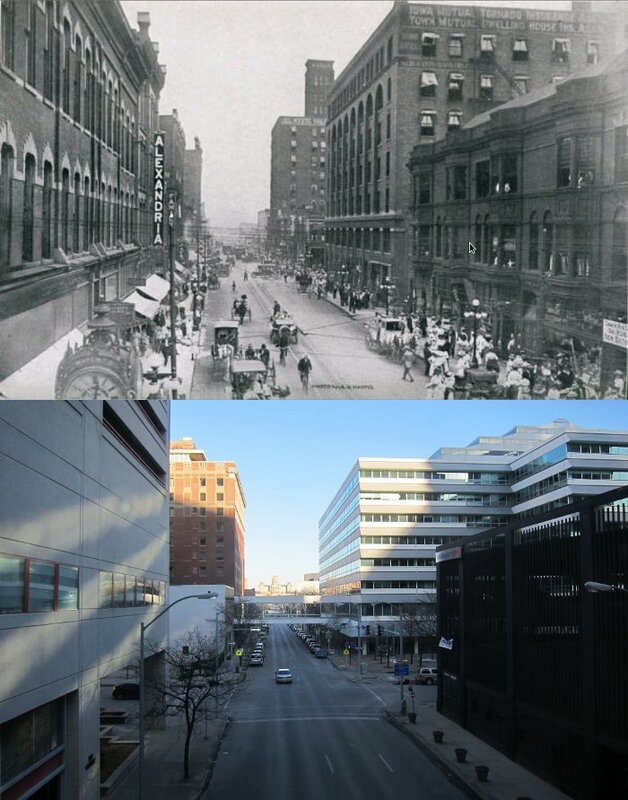 Des Moines looked a lot more lively in a hundred years ago 🙁 Shopping still existed downtown, and there was even a cafe! Much of modern downtown Des Moines consists of alternating block-long office buildings and and block-long parking garages. Its good to see so many corporations downtown, but after 5pm this area is a ghost town. Wow, Des Moines was a total dump in the 70’s. It looks so much better now. The brick building on the left is the temple for the performing arts. It has been beautifully restored! 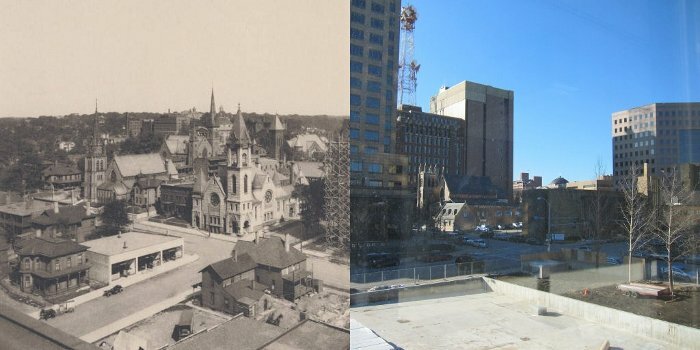 The building on the left is city hall. The new building on the right is Embassy Suites. Other than that the riverfront hasn’t changed much. Looking west across the Des Moines river from city hall. The building on the other side of the river is the old central library. 8th and High (1914) - the most prominent building remaining is St. Paul's, to the left of center. If you look closely you can also see the copper dome of First United Methodist Church in the background. The brick building to the left of the dome is Iowa Methodist Medical Center. 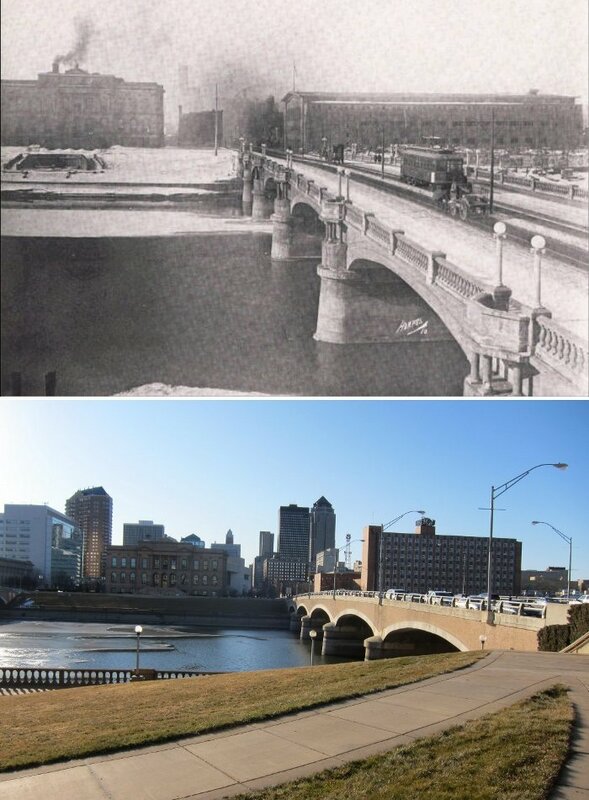 1911, Looking west across the Des Moines river, just south of the Locust street bridge. 1911 - Looking east down Locust from 5th Ave.
1940s - Shopping for Christmas at Walnut and 6th. Sadly all the shops long ago left downtown left for the suburbs. Now its pretty empty. It’s kind of unfair to compare photos of today with photos of 100 years ago. Those photos were taken of the best looking spots of the city 100 years ago. Its understandable that they may not be the best looking spots now. Any list of the most scenic spots in the city today would certainly include spots that were total dumps 100 years ago. Still, its sad to see how much of the city has been gutted in order to suit the automobile and make people’s commutes a few minutes shorter. With a little more foresight the city could have been more people-centered and less car-centered. Fortunately city leaders have woken up to this, and new projects like the East Village and the Brenton Skating Plaza are great places to spend time. The government even ripped out the parking lot at the state capitol and replaced it with a garden! !